I love this! 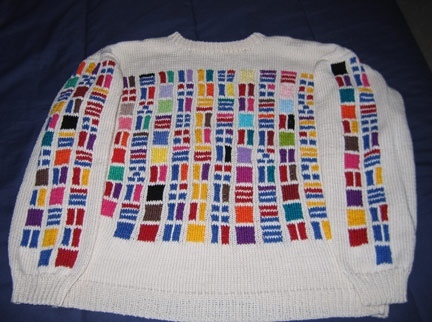 You know, I’ve been wondering ever since I made the sweater if people with synesthesia would be driven crazy by it. So I’m very happy to know you still like it. I’m curious: Do you see a prime number like 37 as having its own color, or does it combine the colors for 3 and 7? I would love to have a unique color for every whole number (and I’ve heard of some math savants who do) but for me, it’s only the digits 0-9 that have colors. Numbers 10 and above are just combos of their individual digits’ colors. And they don’t really blend the way letters do in words. A phone number, for example, is just a pattern of separate colors to me.